The relationship between a landlord and a tenant comes under strain under certain circumstances. In these cases, the landlord may want the tenant to leave the premises. He issues an eviction notice to the tenant, stating the reason for his decision. This mostly occurs when the tenant is unable to comply with the terms of the agreement of lease. Here are some Notice Forms for you to check out. In this letter, all the possible causes of eviction are listed up. The relevant one has to be selected by the landlord. It also states that the failure to comply with the terms will result in legal action. You may also see 30 Day Notice Forms. This notice comes with a deadline by which the apartment has to be vacated. It also specified the reason why the action is being taken. 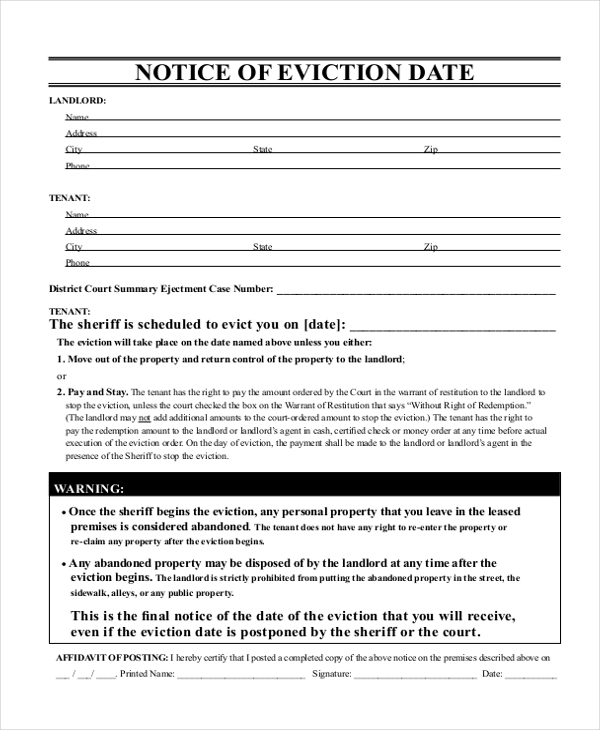 This is a formal notice of eviction, sent from the landlord to the tenant. The legal norms are also specified in the document and the causes of eviction are clearly stated. This is a simple letter, written in a few paragraphs, stating that the tenant has to leave the place due to non-payment of rent. The blank areas in the template are to be filled up by the landlord. You can also see Employee Warning Notice Forms. In this template, the tenant is asked to leave the house. A tabular format is used to present the related information regarding the cause of eviction and other details. 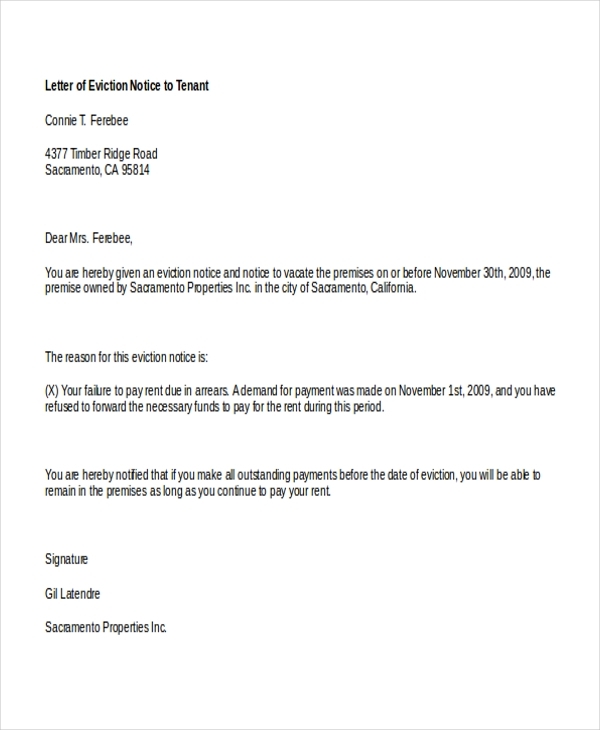 The standard letter format is used in this letter, in the form of different paragraphs, to inform the tenant that he has to leave the premises. Non-payment of rent is the cause of eviction in this case. This is a short-term eviction notice and different sections are used to present the details. In this case, three reasons can be stated by the landlord to support his decision. 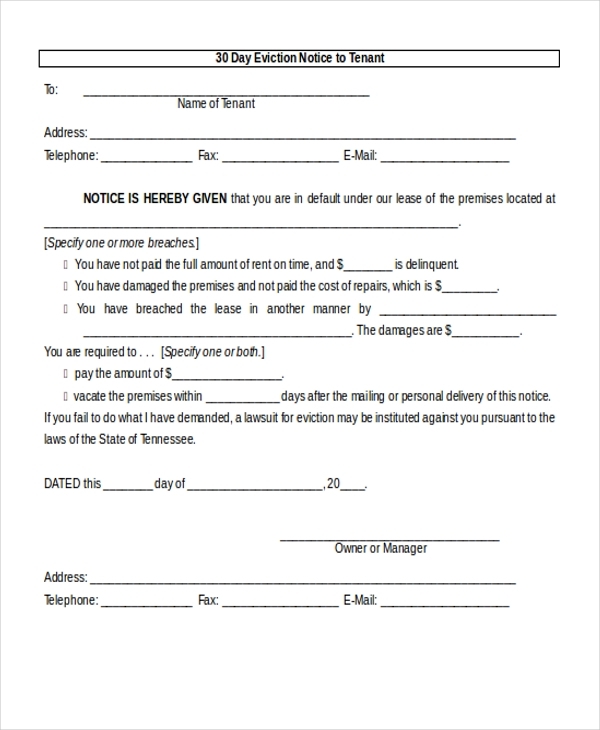 You may also see Eviction Notice Forms. 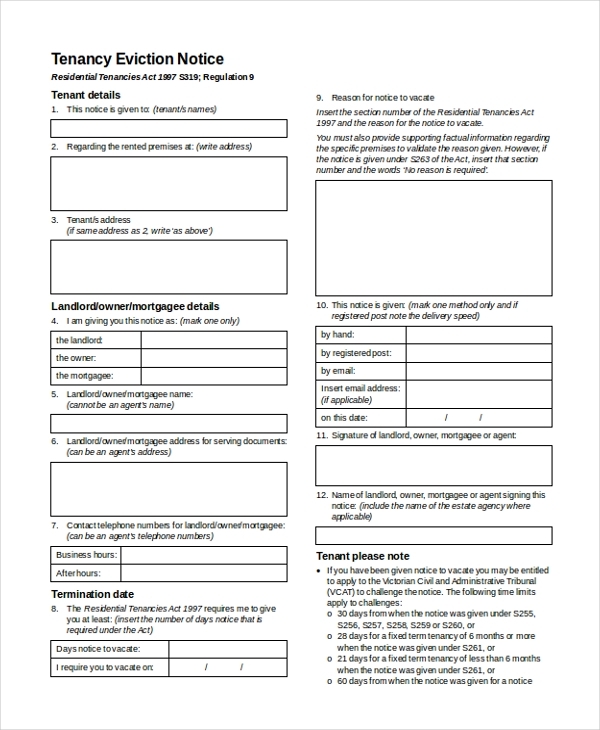 The details of the landlord and the tenant are presented in the first two sections of this template. Then the exact date after which the tenant will not be allowed to stay in the premises is stated in the template. What is The Importance of These Notices? 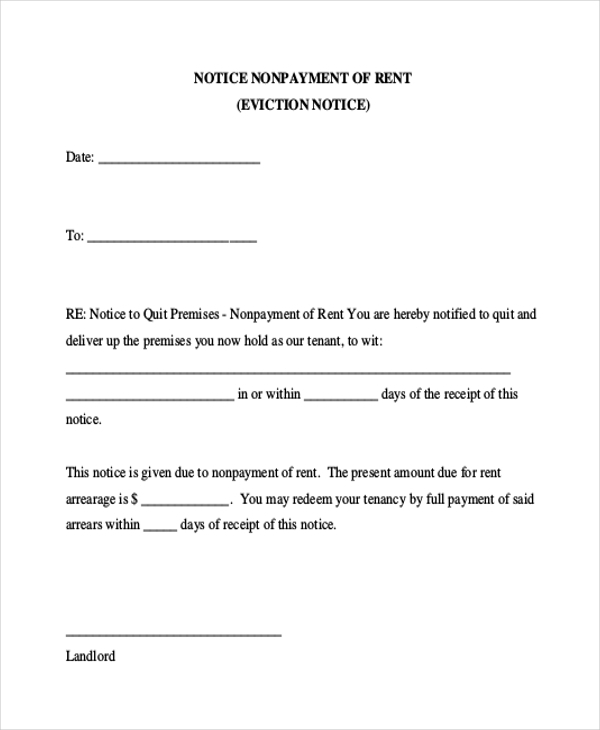 The eviction notice is a formal application issued by the landlord to the tenant. It officially declares that the patient has to leave the premise within a deadline. If the tenancy fails to adhere to the terms of this application, he may face legal action. The landlords use Notice to Vacate Forms to inform the tenants that they should vacate the house or apartment within a stipulated time. the application also specifies the cause for which the tenant is facing such an action. You may also see Notice to Vacate Forms. 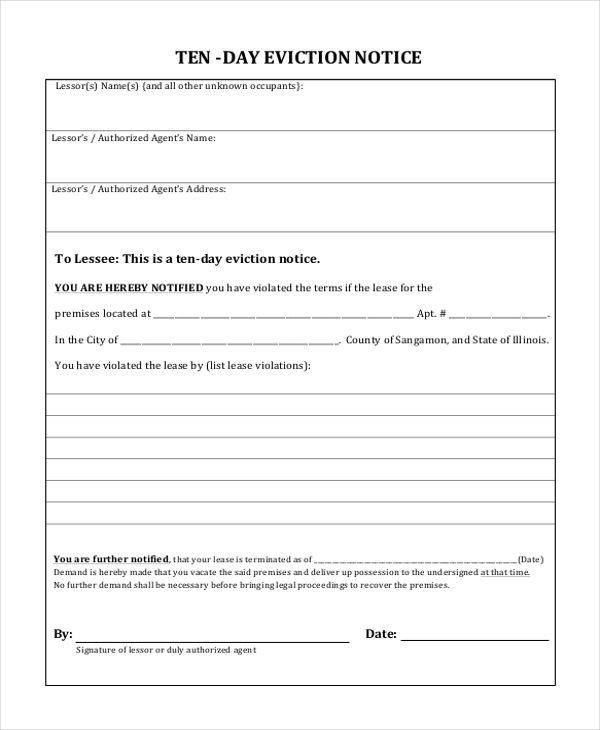 When Does a Tenant Receive an Eviction Letter? If a tenant fails to comply with the terms agreed upon at the time of signing the rental deal, he may receive an eviction letter from the landlord. This may happen due to the failure to pay the rent on time, creating disturbances, damaging the property, or trying to have an extended lease period after the duration is over. Apart from these, the eviction may also take place if the tenant strays from the terms with respect to consumption of alcohol, drugs or entertainment of guests. 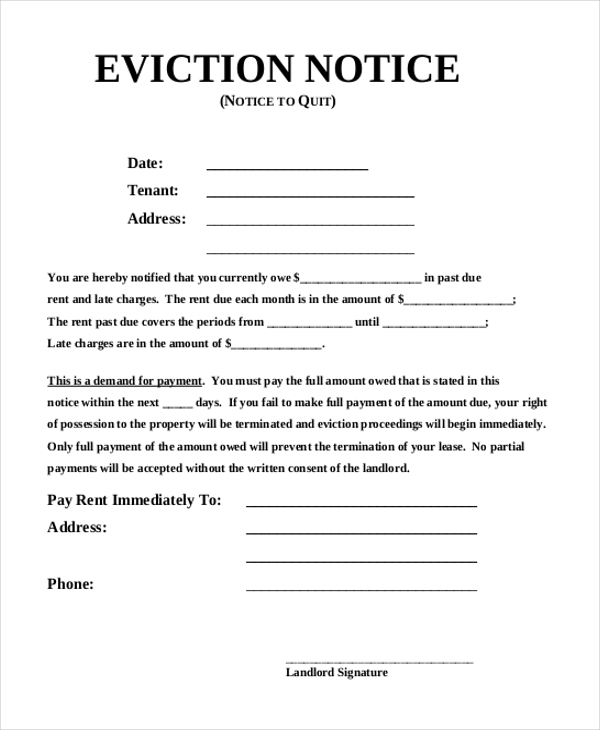 If you need an eviction notice template, you may opt from one from the website. 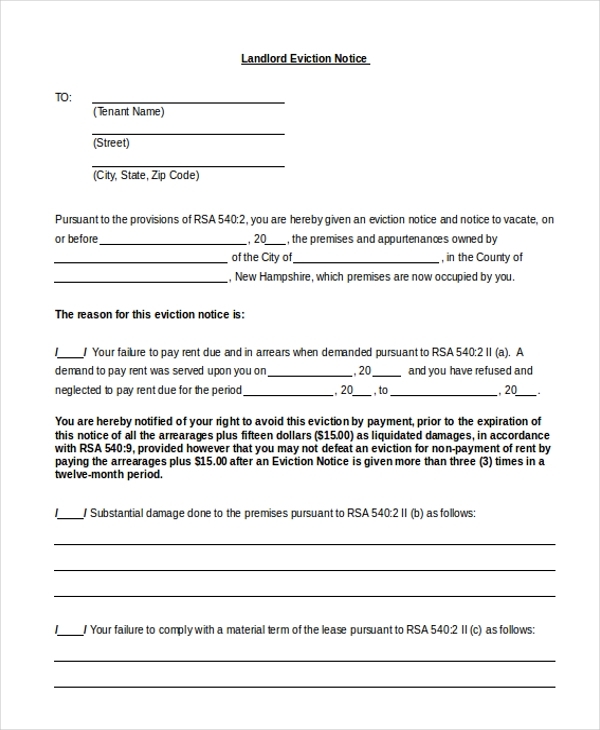 Different categories of eviction notices are available on the website. You may also look out for a 30 Day Notice to Landlord Forms in the portal. These forms can be customized as per your requirement.